Glimpses from our earlier pilgrimage. 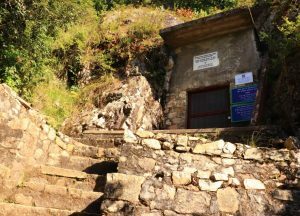 The highlight of this trip is the beautiful hillside where Lahiri Mahasaya is said to have first met Mahavatar Babaji in the autumn of 1861, and which contains the cave where Lahiri spent a previous incarnation. Babaji gave Lahiri Kriya Yoga initiation on this spot, thus launching its spread around the world. We’ll spend most of a day together on this hillside, taking turns meditating in the cave itself. And we’ll spend one day in retreat at Woodsvilla Resort, with an air of deep peace, and high mountain views. 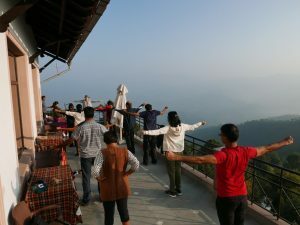 This quiet area of Kumaon has a strong spiritual vibration and also offers saints, ashrams, and stunning Himalayan views. We’ll visit the Kainchi Ashram, with tangible vibrations of Neem Karoli Baba. We’ll chant and share spiritual stories on our bus trips. We’ll spend 3 nights near Ranikhet, at the secluded Woodsvilla Resort. Pilgrimage will be led by Chikako Fujita and Hari Sudhan. Both are teachers of Ananda Sangha Delhi. Please apply as soon as possible as we expect this trip to fill up quickly. Train transportation from and to Delhi will be by chair-car Shatabdi. All other transportation will be by 27-passenger buses. We’ll stay in the 3-star Woodsvilla Resort near Ranikhet, with high Himalaya views. Breakfast, dinner, and two lunches are included. Those from other cities can arrive in Delhi on Thursday 4 April, and leave on Friday 5 April. The central activity will be visiting Babaji’s cave, at an elevation of about 2000 metres. This requires a walk which takes 45-60 minutes each way for a healthy person. Those who need it can take a jeep for the first part of this walk. However, everyone must climb the last part which might be 30 minutes uphill for a very fit person. This is an established rough path of dirt and rock. It can be quite steep in places, at an angle up to 45 degrees. In places there are rough steps formed by large rocks. The steps are at uneven heights, some perhaps a foot high. It is definitely a hike or climb, not a casual stroll. If someone is a slow walker or gets winded easily it is no problem. You can take this path as slowly as you wish. The climb would not be possible for someone who cannot easily climb stairs, or cannot walk on uneven ground. Double occupancy including train: ₹ 21,000 per person. Single occupancy (private room) including train: ₹ 26,000. If you wish double occupancy accommodation and you don’t know another pilgrim, you’ll be as- signed a roommate if possible. 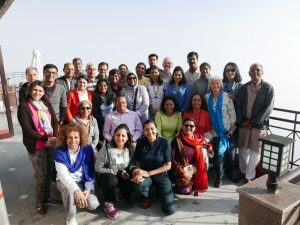 The programme fee includes train Delhi-Kathgodam-Delhi, all group transportation, lodging, 2 meals a day for 2 days, 3 meals a day for 3 days, and hotel tips. 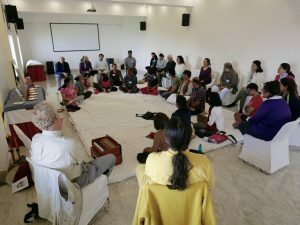 Not included in the fee are most lunches, snacks, and beverages; medical insurance or medical care should you need it; donations at ashrams; personal hotel expenses. You may also wish to contribute to a tip for our guide. 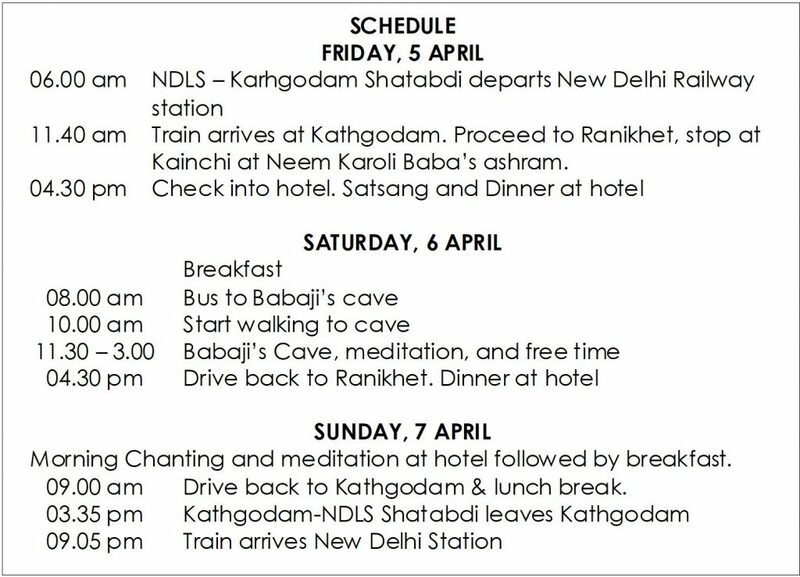 The pilgrimage begins at New Delhi train station 5 April and ends at New Delhi train station 7 April. Completed application form and payment both needed to confirm your space. We ask for full payment at time of application. Copyright © 2019 Ananda Pilgrimages. Powered by WordPress. Theme: Spacious by ThemeGrill.